Powamuya (Bean Dance) occurs across Hopi in February. In this complex series of interwoven events, to promote fertility and germination and set the stage for an abundant year. Hopi families put an intense amount of energy and focus into this. Most of these activities are not open to the public. The ogres, guards, and whippers appear throughout the villages as disciplinarians and reminders to follow the Hopi way of life. The ogres go door to door threatening to take the children that have been naughty, but the parents bribe them with meat and promises the kids will do a better job. Even adults can be called out by the ogres for misdeeds and try to stay clear of them. Some years, young children are initiated at this time into their societies in a very serious ceremony which begins a lifetime commitment. Then an extra day is added for the Pachavu Ceremony which is a dramatizaton of historical events. In anticipation of the coming growing season to promote fertility and germination, the initiated males grow beans in trays in the underground kivas and fill them with prayer energy. How well they grow is a sign for the coming season. Kachinas appear in the villages carrying the bean sprouts and bringing gifts of kachina dolls for the girls and rattles, bow and arrows and lightning sticks for the boys. The ladies prepare bean sprout stew as a physical taking in of the prayer energy for all of the village. In January I had a timeless experience of being in vibration with the prayer for healing energies being evoked by Hopi Bear dancers. Many Hopi people came into the plaza to receive healing blessings from the bears. Bear clan members sponsor this dance once every 4 years. A big gratitude to them for continuing this powerful tradition. Buffalo dances were being put on by groups from across Hopi during January. Families were gathered in support of the youth doing the buffalo dances to manifest winter moisture for the coming growing season. These are no kachina ceremonials, but all ages gathered with focused energy to start the year off with a lot of energy. The sense of community and joy were palpable–I felt lucky to be there visiting friends and sharing traditional food. The ogres, guards, whippers appear as disciplinarians, reminders to follow the Hopi way of life. – See more here. Eototo, the Father Kachina by John SteeleEototo appears each year during Powamu to bless the village. His complex ceremonial actions are to bring water for the crops. Hopi Tutskwa Permaculture Director Lilian Hill will talk about strengthening food security, traditions, and cultural values that support sustainable ways of life, in order to pass that knowledge on to future generations in this visual presentation. Hopi Tutskwa Permaculture helps to initiate hands-on learning projects, trainings, and hosts workshops that support Hopi youth and community to develop skills and capacity in creating sustainable communities. They are also helping develop the plan for the 4 Hopi Head Start playgrounds to install fruit trees, grapes and other shrubs. We are fund raising and seeking partnerships to purchase fruit trees, edible shrubs and drip systems for 3 of the 4 Head Start playgrounds. Volunteers with garden interest are welcome to help with planting and drip system work in May. We also hope to put in garden plots for spring growing experiences for the kids. If you reply to email, I would be happy to send you a poster about this to share with your circle. In Community Center and VVAC next door to Ft. Verde State Park. We will have an info table here–I welcome volunteers to take some time slots during the 2 days. Next door the Pecan and Wine Festival will be going on and special programs at Ft. Verde, so it should be a very lively event. –American Indian Art Show with artists from Hopi, Navajoland, Zuni and several New Mexico pueblo communities. Artists will demonstrate their medium and have their work available for sale. In 2005 a 12-month solar calendar was discovered at the V Bar V Heritage–this film documentary captures this research and presents the amazing results. In 1921 the Hopi were told that “church people” petitioned Congress to stop their “pagan” dancing. A platform was erected on the U.S. Capital steps where both Houses of Congress assembled with their families to see the Hopi dancers. Following the performance, Congress passed a Resolution giving the Hopi permission to carry on their dancing “for all time.” The dancers continued to perform culminating in performances at Carnegie Hall in 1955. The Verde Valley Archaeology Center and Hopi Tribe jointly received a grant to preserve a rare 1957 film of the dancers. This presentation provides background and shows the film. This is a fascinating film–I can’t wait to see it again! We are working with Director, Rayma Duyongwa, to develop a 3 year playground development plan. 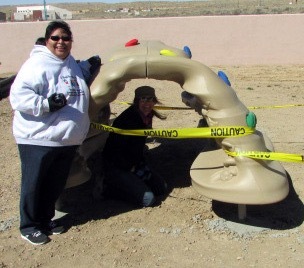 The 12 pieces of equipment we purchased for teh 4 playgrounds has arrived at Hopi. We are taking painted pavers for the hop scotch Feb. 24 when we meet with Rayma and staff for a mapping of the lay out of the playgrounds. The only remaining piece for the March installations is finding a volunteer to cut 5′ length logs for the natural obstacle course and to find volunteers to work with Hopi parents. You are welcome to come help for any or all of the 4 consecutive weekends beginning March 8-9, 2014 with installation work for equipment and some of the natural playground elements such as garden plots, hop scotches made with pavers, man in the maze labyrinth, obstacle course will be underway. You are welcome to email for details if you would like to help.